So if I told you that I haven't been writing, you might not be surprised. I'm currently unemployed, dealing with crushing Depression, and still recovering from being divorced. (Yeah, it's been seven months. No, I'm not over it yet. Let's see you get over the end of a 23 year marriage quickly. No, please, show me. I'd really like to know how.) But the fact is that I have been writing. My problem has been that I'm writing too many things. Anyway, where were we? Mr. Too Many Irons in the Fire. I have one finished middle grade novel, another on the back burner, three or four finished picture book manuscripts, several short story ideas, a cool kid detective story that has been burning in my mind, and the desire to write an ADHD eBook based in part on my escapades as an ADHD expert. (Oh, have I been holding out on you. I've got a story so horrifyingly typical of ADHD that it is being saved for the book.) I've got a few hundred ideas and no time to write them. When you flit from project to project like a butterfly hopped up on nectar, you don't get anything finished. So I spent last Monday making THE DECISION. I can't do it all, and I work best one idea at a time, so which idea was it going to be? Was I going to rewrite my middle grade novel about the singing cat? Was I going to write that dark fantasy short story? Was I going to start the kid detective project which would require one new story being released per month with illustrations? (I never said the ideas were realistic…) Or was I going to write that ADHD eBook? 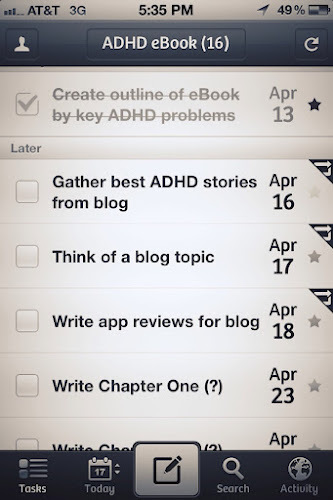 After an agonizing few hours of sorting pros from cons, I decided to write the ADHD eBook. It seemed the easiest project to do because its writing style would be an extension of what I was already doing here. Also, I needed to focus in on getting a paying gig somewhere and that eBook seemed the project least likely to distract me. Do you know what happened? Once I made that decision, I created a todo list and started checking things off that very night. I've been steadily working on the eBook all week. I cannot believe how much progress I have made. Today I created the eBook's outline by chapter, and next week I start researching this blog for stories. (Follow along on Twitter and you might be able to help out.) The eBook is happening. Now that I have focus, I am very surprised how little focus I had before. I see that Depression clouded my mind, keeping me down and unproductive. Again, I find the impact of the divorce far more reaching and disruptive than I anticipated. So many coping strategies forgotten by the wayside… I am glad that I have spent the past twenty years learning how to regulate my mind. I pulled from those experiences as soon as I was able. Maybe in a shorter time than I think I will find myself "over it" and well adapted to single life. Just in case I have a relapse or two, I have "hired" on a friend to help. I created an online todo project over at Producteev and made him a teammate. He checks the list daily and looks to see that I've been busy. I don't want him to hold my hand, so he has been instructed to prod me only if he doesn't see any activity after three days. That gives me plenty of opportunity to overcome my Depression or ADHD fog all on my own. I'm hoping the system works. If you are struggling to accomplish your goals, maybe you have too many of them. Pick one goal to work on, and get a friend or family member to help you stay on track. It's bound to help you feel better about yourself, and you may even finish the goal faster than you imagined. But start by picking that ONE project to work on. Good luck!